I actually discovered Ortolan nearly a year ago on the Chowhound boards; its innovative twist on contemporary French cuisine had always intrigued me, so it was about time I gave it a go (an ortolan, by the way, is a small game bird; traditionally eaten whole, it has a legendary place in French gastronomy; however, overhunting has resulted in ban on its sale in France). 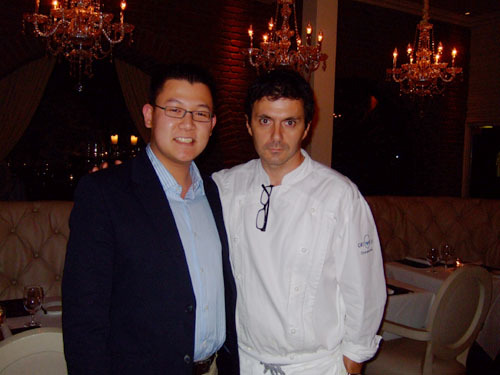 The restaurant is the product of Executive Chef Christophe Émé and wife Jeri Ryan (yes, the actress). In fact, Jeri regularly acts as host, though as of late, she, being pregnant, has largely relinquished the role. 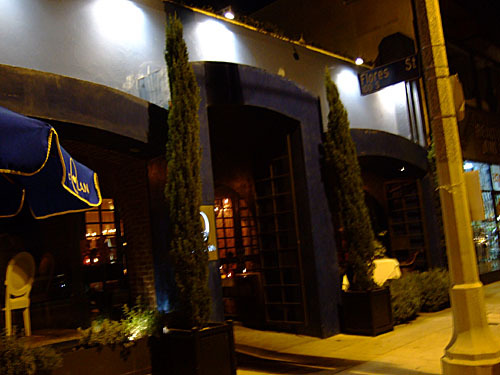 Located right at the intersection of 3rd and Flores, Ortolan is fairly hard to miss given its large, imposing azure entrance. Valet parking is available right in front. 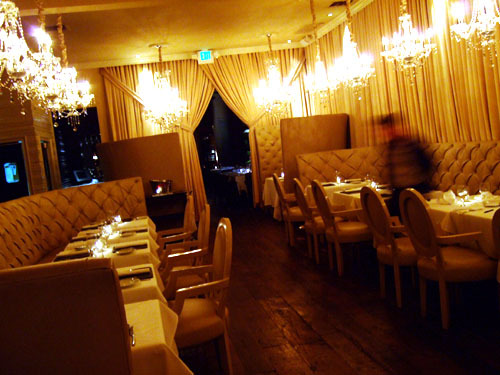 The main dining room consists of two rows of tables flanked by booths and holds about three dozen patrons. There is also a semi-private room running parallel to the main salon. 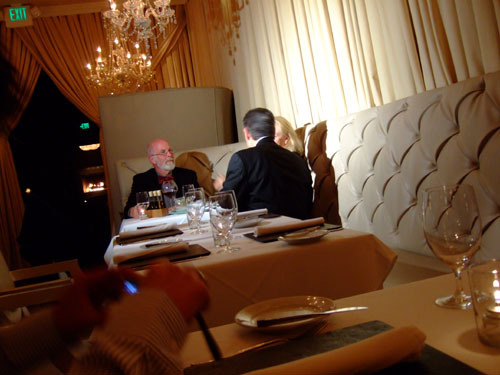 During our meal, a local TV crew went about interviewing diners, in response to Ortolan's achievement of a 1-star rating in the 2008 Los Angeles Michelin Guide (looks like I've been to 10 of the 18 starred restaurants - not too shabby). Moving past the main dining room, we come to the bar area. 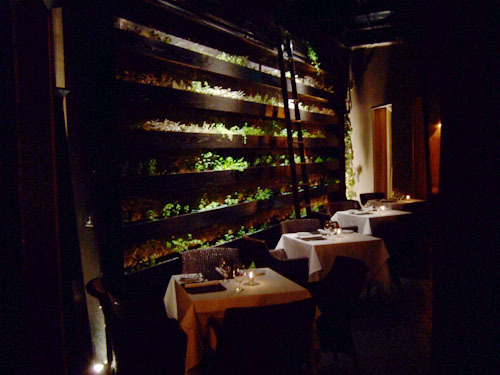 Adorning the wall is a planter filled with various herbs used in Chef Émé's cooking. 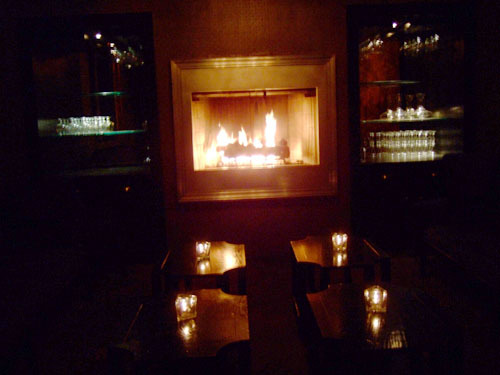 Past the bar is a dimly lit fireplace lounge where I saw a couple cozying up. 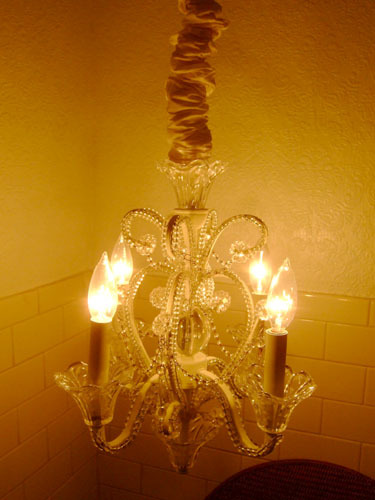 In the bathroom I encountered the most elaborate lighting fixture I've ever seen in a men's room. 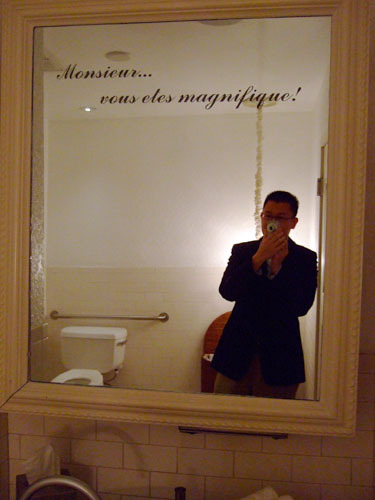 For the non francophones out there, the writing on the mirror reads "Sir...you are wonderful!" Indeed. 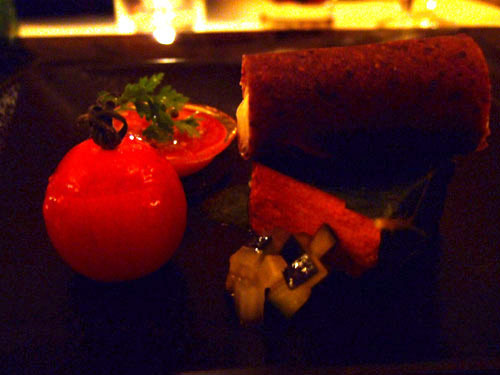 As usual, we opted for the most extravagant menu option available: the Chef's Autumn Menu. 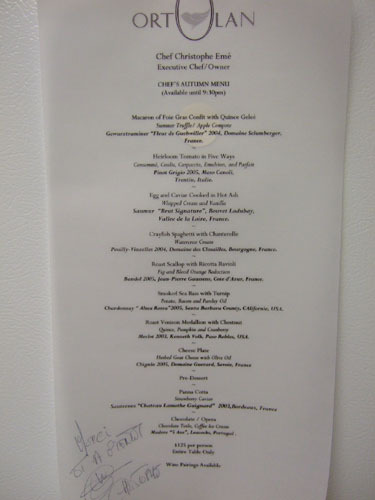 Note the signature of Chef Émé; I can't exactly figure out what he wrote, but it's "Merci" (thanks) for something. Click for larger version. Not too long after we were seated, the Champagne cart was wheeled over. One of my dining companions ordered a bellini, but made with violet instead of the traditional peach (and served in possibly the most ornamental Champagne flute I've ever seen). 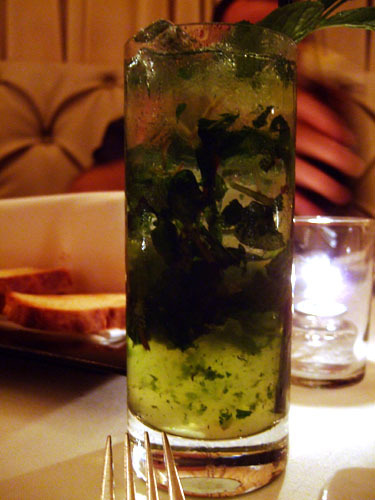 As for me, I started with my signature drink, the mojito; it was a sweet preparation, with lots of mint, very nice overall. 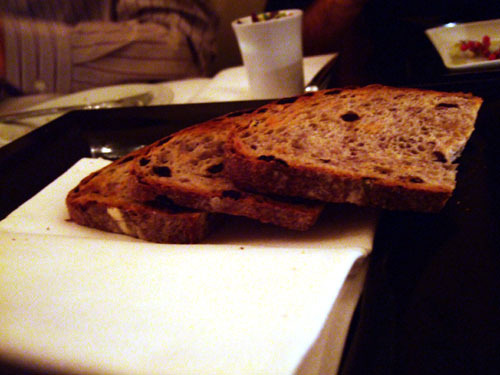 Four varieties of bread were offered: country, whole wheat, walnut raisin, and Italian ciabatta. We were first provided pats of butter, along with salt and pepper. 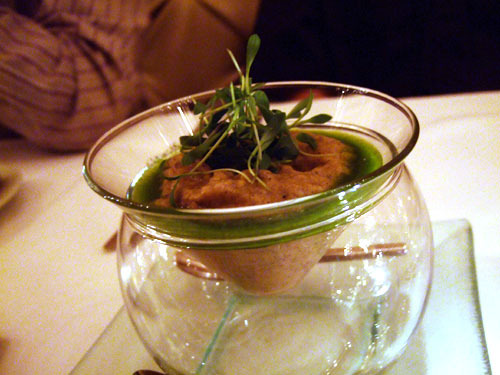 We were then brought "eggplant caviar," basically baba ghanoush, for our bread. This was quite delicious and was quickly devoured. 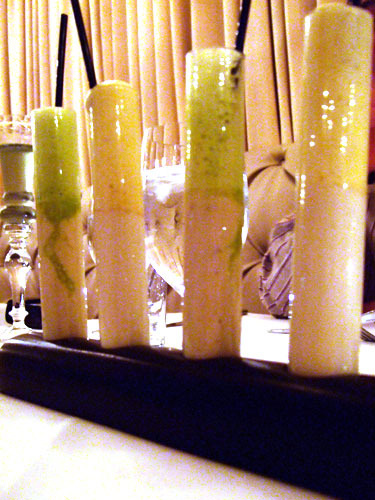 Two test tubes each of cauliflower and pesto soup, drank through a straw. I found the soups very rich and silky smooth, almost bisque-like actually, with the individual pesto and cauliflower flavors melding seamlessly with their creamy bases. Probably the most innovative presentation of soup I've ever had. Summer Truffle, Apple Compote. 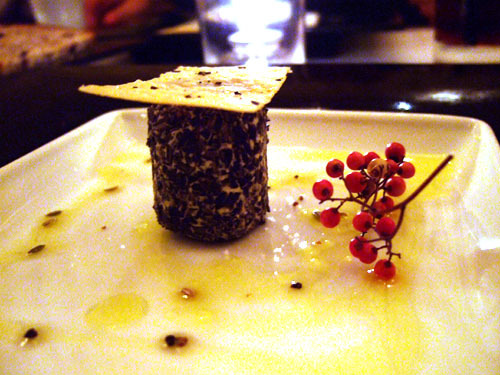 A piece of black truffle was embedded in the cube of foie, which went well spread over the included heart-shaped pieces of toasted brioche. 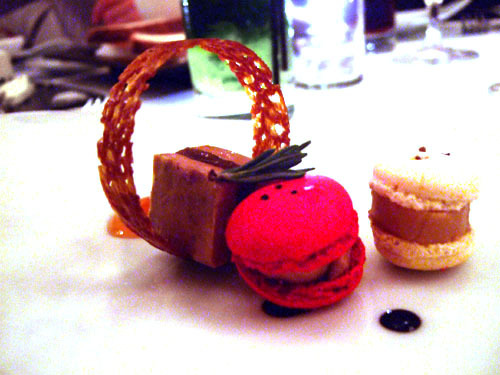 The macaron (not to be confused with macaroon) foie gras "sandwiches" were even better though. 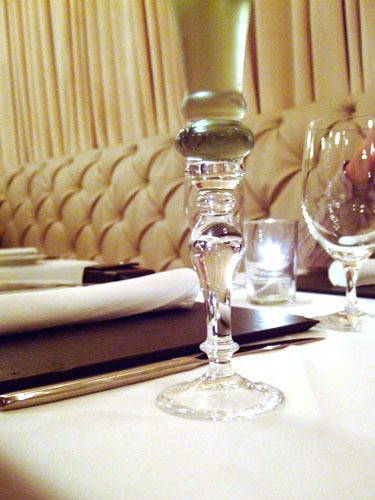 We enjoyed the paired Gewürtz, which had a fruity sweetness that complemented the foie's richness nicely; in fact, we mistook the wine for a Riesling auslese. 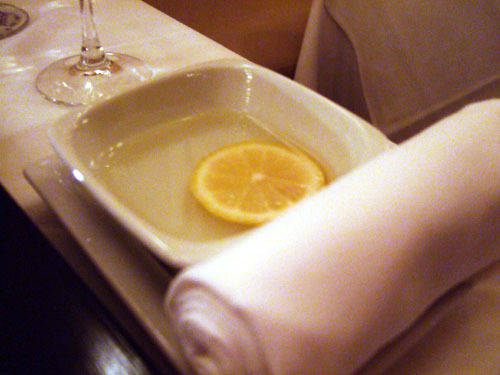 Consommé, Coulis, Carpaccio, Emulsion, and Parfait. Clockwise from bottom right in the first photo, we have the consommé, the coulis encased by a gelée (where's the carpaccio? 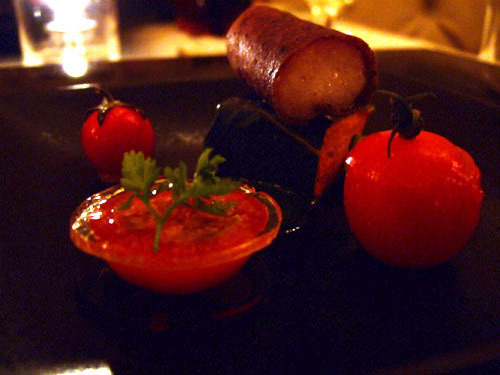 ), a small cherry tomato on sweet onion, and emulsion (or "water" according to our server) atop a leaf-wrapped parfait. 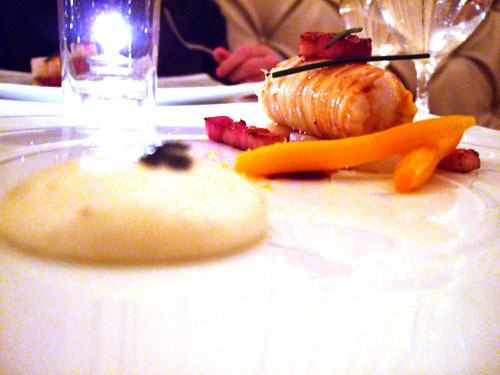 My favorite was the coulis, though I found the emulsion very interesting, as it had an almost ethereal texture to it. A few of us even remarked that the parfait was reminiscent of pizza! The Pinot Grigio that went along with the course was very light, with notes of stone fruit and apple, as to not overpower the delicateness of the tomato. Whipped Cream and Vanilla. 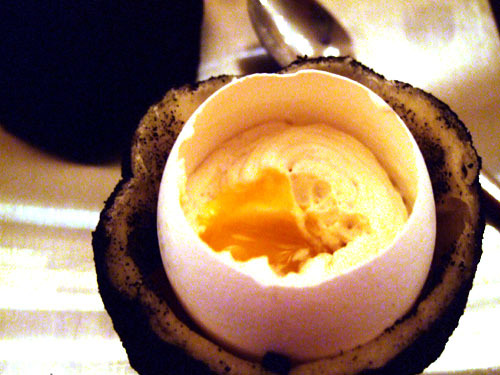 The egg was cooked in a black rock-like contraption that seemed to be made of a resin-like material. As you can imagine, we were all a bit disconcerted when the monoliths were presented to the table. 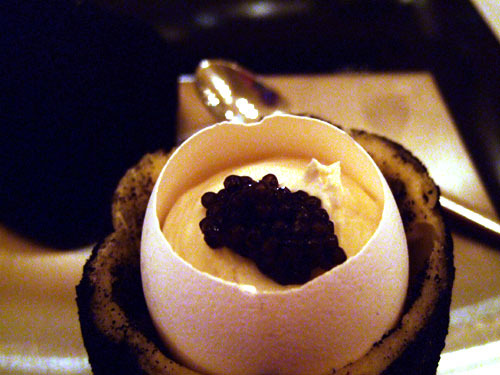 I took the whole of the caviar in my first bite, and the sharp brininess of the roe contrasted nicely with the smooth, mild egg white. My next bites mixed the tangy yolk with the creamy white. The lemon was there in case we should dirty our hands with the ash. The wine here was actually slightly sparkling, which was quite refreshing and a pleasant surprise. Hazelnut, Quail Egg, Cabbage. The hazelnuts didn't go over well with me, but I did enjoy the egg and the cabbage especially. The ravioli itself was a bit overdone for my tastes though; I was expecting something richer and smoother. Unfortunately, this ended up being the weakest course of the night for me. Note that this dish was substituted on the menu for the Crayfish Spaghetti with Chanterelle. 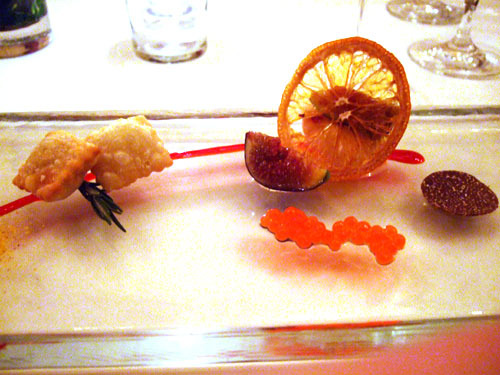 Fig and Blood Orange Reduction. 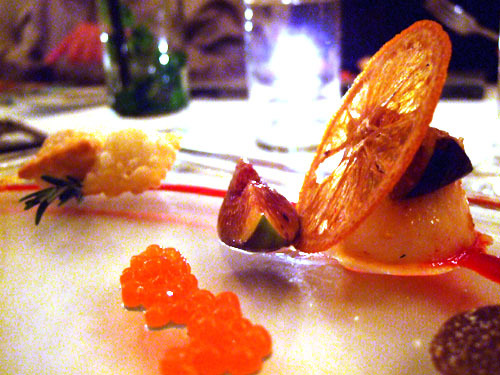 The small spheres contained essence of orange while the disk to their right is black truffle. 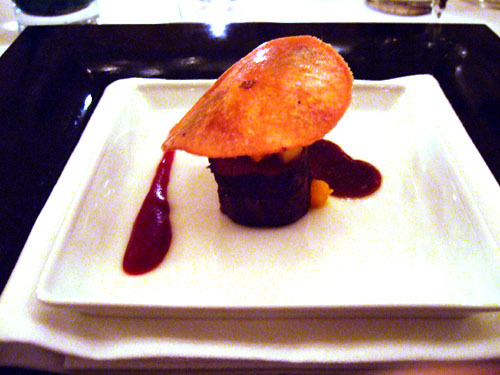 Hidden behind the orange chip, the scallop was well cooked and went surprisingly well with the dish's tart accoutrements. 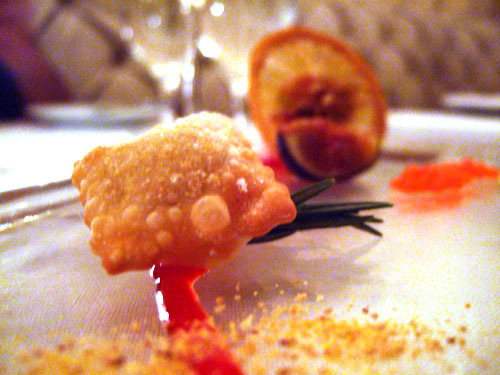 However, I liked the ricotta raviolis even better. The paired wine, a Bandol (a relatively unknown region in Provence, mostly known for their reds), went well here. Potato, Bacon and Parsley Oil. The sea bass had a very firm yet flaky texture, which I appreciate. 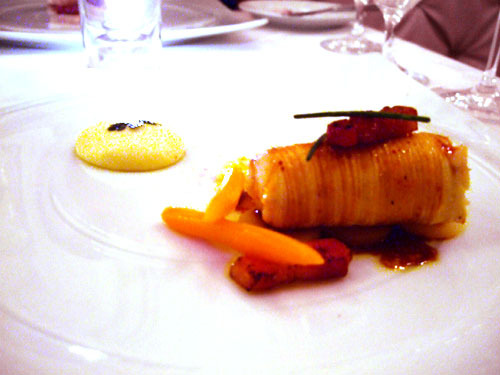 The turnip was actually wrapped around the fish, and although it didn't add much flavor, it did add an interesting consistency to the dish. The smoky bacon lardons, on the other hand, played foil to the mild fish. The Alma Rosa represented our first venture of the night into the new world; the Chard was very crisp but a bit drier than I prefer. Quince, Pumpkin and Cranberry. 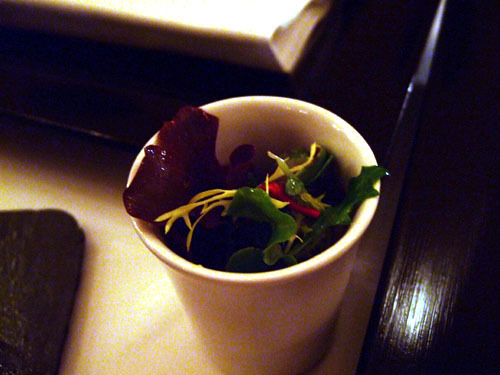 The venison had a very unique flavor to it, stronger than what I'm used to; I liked it. Texture was perfect. 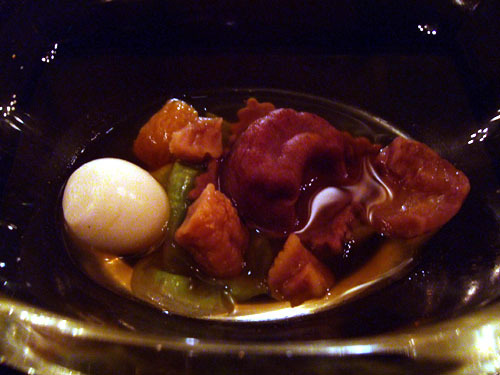 I didn't really care for the quince and pumpkin though, as their sweetness clashed a bit with the meat. The Merlot was a fairly typical example, with a dense nose of smoke and berry, leading to a somewhat tannic finish. It stood up to the venison's pronounced flavors. 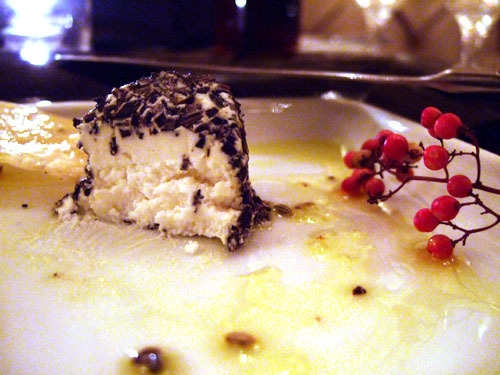 Herbed Goat Cheese with Olive Oil. 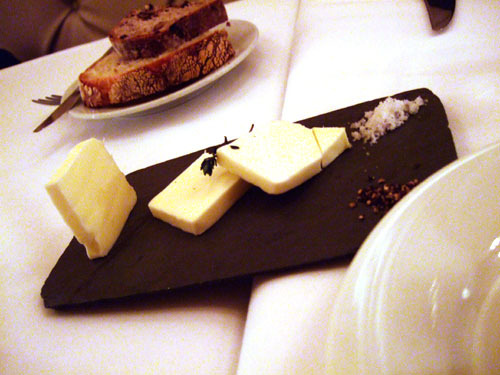 The cheese was relatively mild for goat cheese, and had a pleasing texture to it. The herbed coating added a nice complement, as did the pink peppercorns. The cheese also came with walnut raisin bread and a small salad (first time I've been served salad with a cheese course). An intense sorbet topped with a sprig of mint, this really captured the essence of plum. A nice segue into dessert. Strawberry Caviar. This is one of the most creative presentations of dessert I've ever seen. 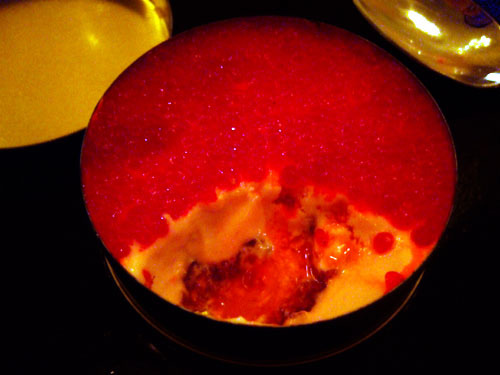 The panna cotta was very good on its own, but really shined with the caviar - tiny spheres filled bursting with strawberry essence. I asked my server if I'd be able to keep a tin, but he couldn't oblige. The Sauternes was quite nice as well, though it's sweetness was definitely tempered by the dessert. 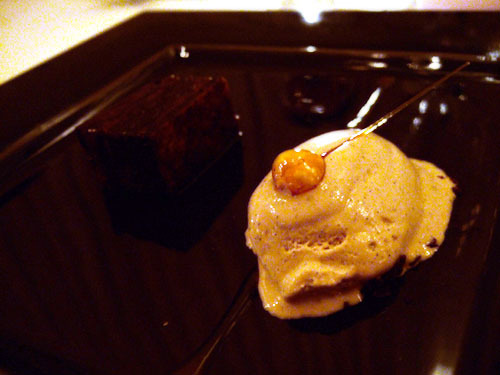 Chocolate Tuile, Coffee Ice Cream. 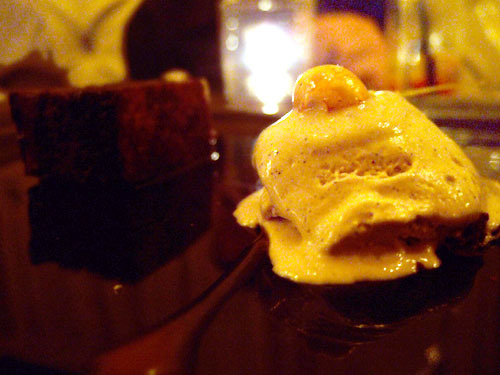 The ice cream had strong coffee notes, which nicely complemented the almost airy chocolate tuile. The wine was definitely interesting; it had a smoky nose and super-intense flavors of earth and strawberry on the palate. It reminded me a lot of the Madeira from 1863(!) I had at the French Laundry. 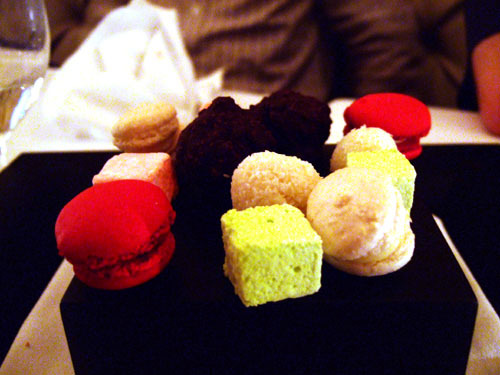 Various confections came presented on a black cube at the end of the meal, including the macarons used in the foie gras "sandwiches" above. Towards, the end of the meal, Chef Émé came out to speak with us. By that point, I think we were the only ones left in the restaurant. If I had to come up with one criticism, it would be that the meal was heavily biased toward lighter dishes. 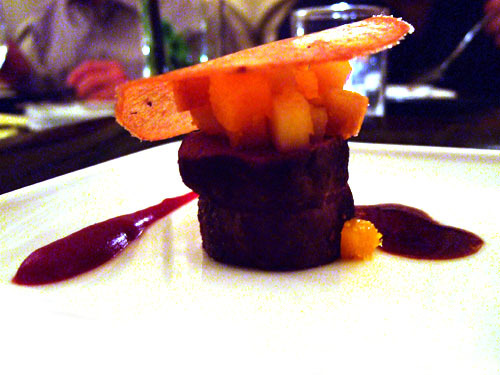 The venison was the only true meat dish, and the merlot the only dry red wine. Some lamb, beef, or even squab would have been welcomed. 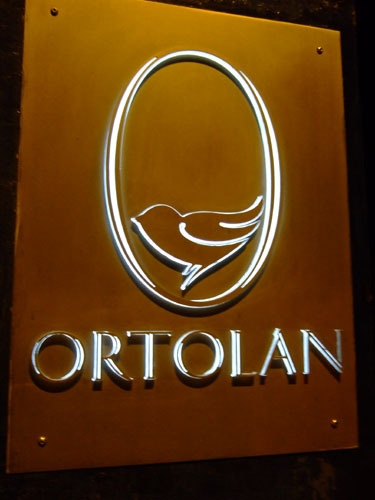 But with that being said, Ortolan definitely served me some of the more inspired dishes I've had in the city. As such, I do believe it's deserving of it's Michelin star. However, at the same time, I can certainly see why other reviewers have chastised Émé and company for trying too hard. Some of the preparations and presentations may seem like a bit too much, though I admit I do have a penchant for such pomp. Émé is still a relatively young chef, so perhaps he will temper down with age. Before I left, I asked one of the servers if the restaurant would serve its namesake bird; he didn't know but said that he'd inquire. 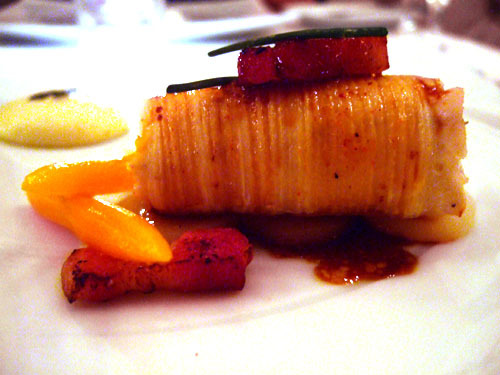 Ortolan at Ortolan is definitely something I'd come back for. I don't see it on their web site, though I am a bit wary of truffle menus. I am dying to try out one of their tasting menu. The venison does look good. Majority of his dishes tends to be on the light side. There are some big savory dishes on the a la carte menu, but generally he tends to cater to the "Hollywood" crowd that likes small bites, light, fresh, and beautifully decorated dishes. You know, I'm actually moving somewhat toward the lighter side as well these days. "Small bites, light, fresh, and beautifully decorated dishes" sounds good to me! I think he wrote, "Et, a bientot." 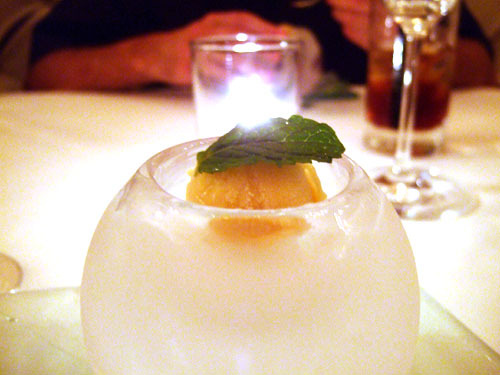 The presentation of the panna cotta is almost identical to a dish Michel Richard does at Citronelle (in Washington, DC) called "Lobster Begula Caviar." Richard uses an enormous, fake caviar tin and inside is a layer of squid ink tapioca balls (could be israeli couscous, but I'm fairly sure it is tapioca) that look like large caviar, and underneath is a layer of lobster in a creamy sauce of some sort. Terrific dish. I'm not sure which dish is the original (or if they are both following someone else), but it is one of Richard's signature dishes, so I suspect he came up with it. In my pre-blogging days, I once made a trip over to Citronelle when I was on a business trip. It was the strongest meal I'd had up to that point. It is interesting that you bring it up though. 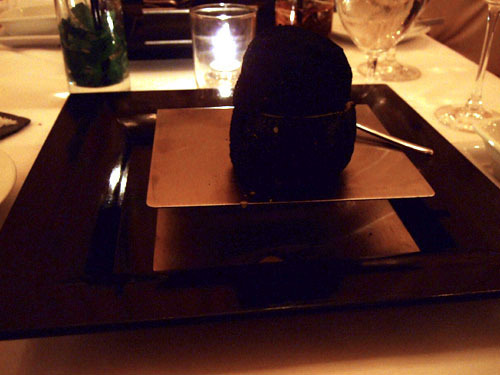 Just recently, I was at Joel Robuchon, and he had a very similar looking dish as well. 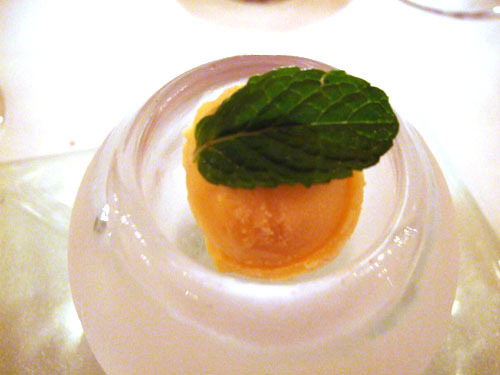 So perhaps both Richard and Eme are following M. Robuchon's lead? 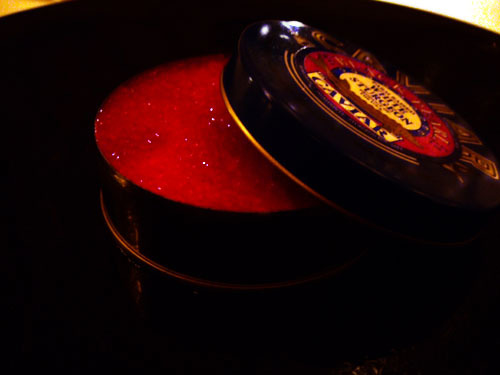 Ferran Adria at el bulli was the first to present the sutto caviar in a tin. Ferran was also the first to do test tubes like the soup courses. Anon: Ahh not surprising at all. JB: Thanks for the clarification there. Good timing on the comment, as the Chef is actually planning on opening a new restaurant down in Orange County.